Nus appeared as guest on Cheers at GHOne TV Saturday. After, he received a call from Alex Asante (GFA) who told him his money and flight ticket was ready at the FA offices. 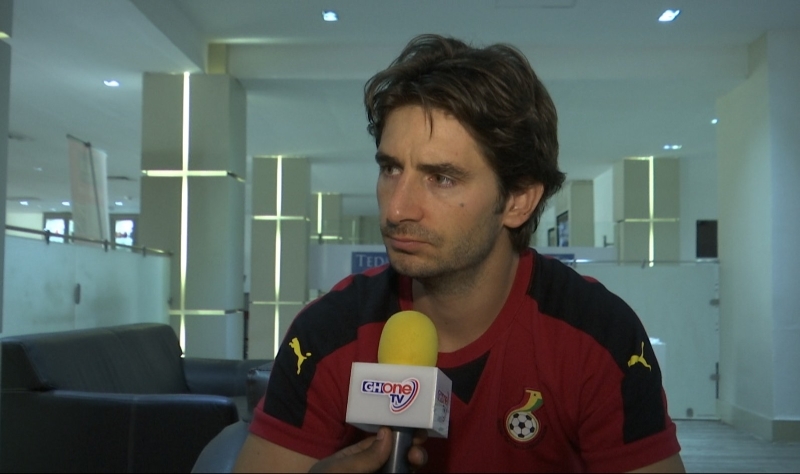 One of Black Stars’ assistant coaches at the 2017 Africa Cup of Nations, Gerard Nus’ standoff with the Ghana FA over unpaid monies took another bizarre turn Saturday as the Spaniard alleges of being handed a raw deal which ended up with his missing a flight back to his native Spain later in the night. In a note copied to starrsportsgh.com, Gerard Nus reveals that after his appearance on GHOne TV that morning, he received a call from the Ghana FA’s protocol officer Alex Asante who informed him his unpaid money which caused him to stay back in Accra for the past 7 weeks was finally ready adding that his flight had been booked for a return to Spain in the night. According to the Spaniard, the end to the saga never was as he was made to miss his flight due to a scuffle over who to settle the hotel bills he had incurred since February 5. The former Liverpool backroom attaché has accused the Ghana Football Association of playing a “dirty card” on him by asking the hotel officials to demand parts of the expenses incurred in his 7-week stay at the posh facility. “Around 8.00pm I went to say “bye bye” to all lovely people of Alisa hotel, but the reception desk people told me that a bill on my name had to be paid. “I told them that all the times that I came to Alisa (few times since Dec 2014) I have never paid anything at all. Everything was paid and took care by GFA. Everything means room, food, laundry and caffee/drinks,” he noted. Nus however admitted Mr. Asante had earlier on Friday prompted him of the need to pay some of the bills though he disagreed, stating he would have accepted it if he had been told from the start when he was placed in the hotel to wait for his money. “Yesterday (Friday) Alex Asante told me for first time that some of those expenses would have to be paid by me. I disagreed completely for 2 reasons: 1) I never been told about it (until yesterday). 2) I never paid before (when I’ve been hosted previously here in Ghana by GFA),” he explained. “Do not take me wrong, I will be willing to pay if that was been told me since the first day that I arrived to the hotel. But this was not the case. (“you cannot invite someone to you home and tell him that he has to pay some the day that he is leaving you”). This is just not right. “Security of Alisa hotel did not allow me to leave. They were saying that Alex Asante told them that I had to pay for few things…,” Gerard Nus added. Hi, I hope you are fine. I would like to tell you few things that happen today (Saturday). On Morning after the tv show that I was invited to attend as guest at GHOne TV, I have received a call from Alex Asante (GFA). He told me my money was ready so I could come and pick it up from GFA offices. Also they said that my flight would be booked for tonight. Everything good. As you can imagine I was so happy. So finally after 7 weeks I was seeing a positive end of this unfortunate story. I called my family back to Spain and they got everything organise to pick me up from Barcelona airport on Sunday. Around 8.00pm I went to say “bye bye” to all lovely people of Alisa hotel, but the reception desk people told me that a bill on my name had to be paid. I told them that all the times that I came to Alisa (few times since Dec 2014) I have never paid anything at all. Everything was paid and took care by GFA. Everything means room, food, laundry and caffee/drinks. Yesterday (Friday) Alex Asante told me for first time that some of those expenses would have to be paid by me. I disagreed completely for 2 reasons: 1) I never been told about it (until yesterday). 2) I never paid before (when I’ve been hosted previously here in Ghana by GFA). Do not take me wrong, I will be willing to pay if that was been told me since the first day that I arrived to the hotel. But this was not the case. (“you cannot invite someone to you home and tell him that he has to pay some the day that he is leaving you”). This is just not right. Now it is 22.41pm and my flight is already gone. Security of Alisa hotel did not allow me to leave. They were saying that Alex Asante told them that I had to pay for few things. I explained them the situation. I believe that many of them were really comprensive. They think how someone supposed to pay for something when he never had to pay before? why he supposed to paid for something if previously he has never been told? After talking on the phone with some managers and people at Alisa..we could not reach any agreement. I did not accept to pay that bill. And I will never pay it. Because this is not the right way of doing things. Because it is not fair. After this, I have to admit I did not act in the best behaviour as I was desperate to leave and get to this plane back home and to see my family. I really wanted to get this plane. And they did not allow me to leave the hotel. I felt like a prisoner. It is really sad. I have been waiting to get my payment for 7 weeks after African Cup of Nations-Gabon 2017. Once finally I got paid and I needed to just take the place back… GFA had to play this card. This is dirty one. I am really angry and upset about this. So I am now willing to sleep in the sofa of the hotel lobby. Feeling like a prisoner more than ever. Before at least I could leave free from the hotel to town waiting to get paid for my job with Ghana. Now it is a different story. Now I am not allowed to leave the hotel because the people that booked this hotel for me (gfa) are not willing to pay some of the expenses. I am sorry for any inconvenience that I may cause to my lovely people of Alisa and to the guest. Thanks for you time in reading this.